Im vector lover, and im also the fans of balung. He is my friends in Solo ID, I know him from deviantart. After I add his messenger, I saw him online and ask some question about vector. He is a kind of nice friends, easygoing but always busy for do some art. 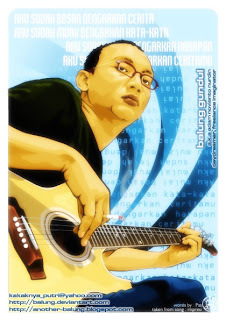 He have cool gallery at balung deviantart, if u a vector lover please enjoy his art on there. Now he work in some hospital in solo, nothing art there but he still dedicate his life for vector art and never stop to make some vector. Last time I meet him when he go to semarang for some meeting in horizon hotel. He have a good kind of humors but in seriusly face. That make me confuse how to talk with him. He also play to my internet cafe in visito.net for make some art with me. Hmmmm... so fast and no need to think. I think his hand can walk without surplus from brain, damn it. Just using Coral Draw 12 and done some art. One thing that he always told to me, and I still learn about that. I can't use coral, the one tool that i can use just photoshop. yeah, he right my art only small art can't resize to biggest couse photoshop using pixel for draw. yeah the kind of tool for vector art is corel draw, adobe illustrator, macromedia freehand, and another vector tools. Read this before do some vector art, maybe it used for you.